Tamanyan was the city architect of Yerevan. His plan, intended for a city of a couple of hundred thousand residents, has since been mushroomed into a metropolis of over 1 million. The center bears his firm imprint however, as he came up with the wide avenues, the ring roads and the numerous parks. Even the brand new pedestrian Northern Blvd in the heart of the center is part of his original plan. An example of a building he has designed is the Yerevan Opera house, which has won awards for it's design, which combines two venues in one building. Alexander Tamanyan (1878-1936) is by rights considered to be the squares chief architect. He moved to Yerevan from Petrograd soon after the revolution, when he was already a famous architect and an academician. In 1924 he drew up the first general plan for rebuilding Yerevan, in which the future central square was given a special organizing position. In those far-oft years Tamanyan was able to see the features of the socialist city of Yerevan in the small, provincial town. Even his most ardent supporters thought some of his ideas too extreme, and many totally impracticable. The square is framed with the buildings of the Government, Marriot Hotel, the Foreign Ministry, Post Office, designed by Alexander Tamanyan in the best traditions of the Armenian architecture to make up a beautiful ensemble - a masterpiece and truly national work of art. Tamanyan incorporated national traditions with contemporary urban construction. His design presented a radial-circular arrangement that overlaid the existing city. 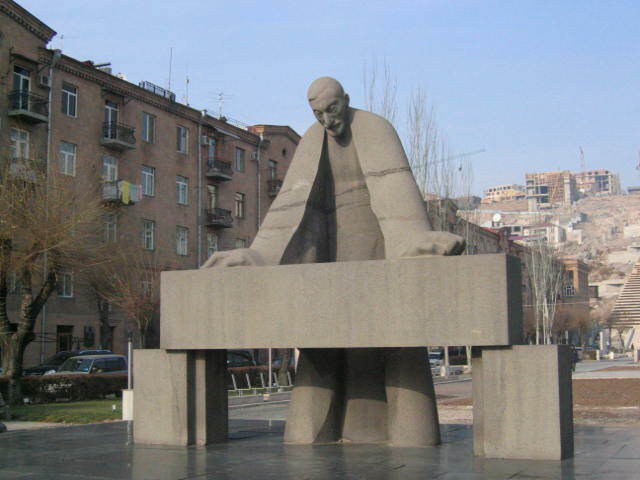 The monument to Alexander Tamanyan perhaps is the only statue of an architect in the world. It was opened in 1974 in the center of Yerevan near Cascade. The sculptor of the statue is Artashes Hovsepyan.